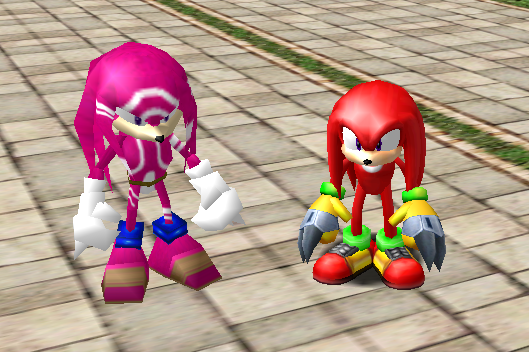 Character models in SADX are the cornerstone of the SA1 vs SADX debate. 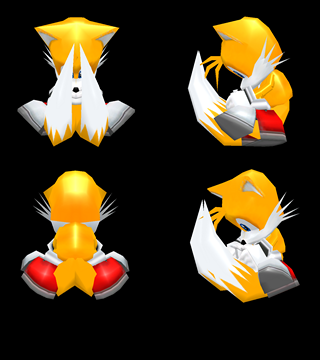 They’re one of the few aspects of SADX that can be considered an improvement over the original game as they have more polygons resulting in a more detailed look. It’s particularly noticeable if you look at characters’ hands. 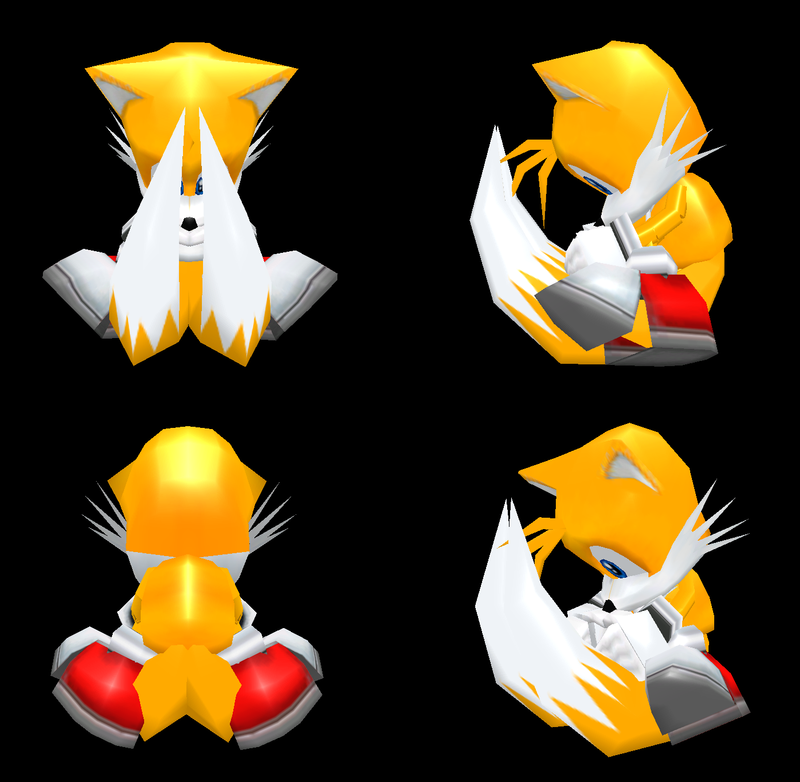 Dreamcast character models have “mittens” like many other games at the time, while SADX models feature hands with clearly separate fingers. 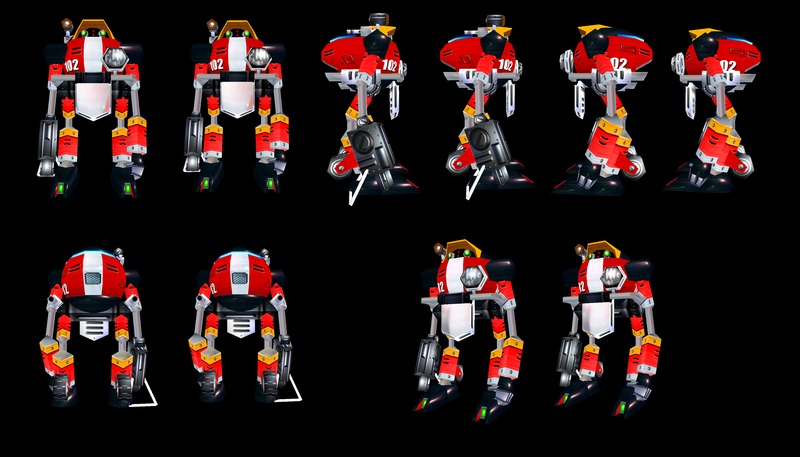 *Apart from some material flags, E-102 Gamma’s model is identical to its Dreamcast counterpart, but there’s a transparency issue with his chest, which will be discussed separately. Some people prefer the higher poly SADX models, while others say they prefer the original models aesthetically. Some people argue that the SA1 models for Sonic, Tails and Knuckles have proportions resembling those characters in the classic Sonic games, while the SADX models look closer to more recent Sonic games, especially Sonic Adventure 2. 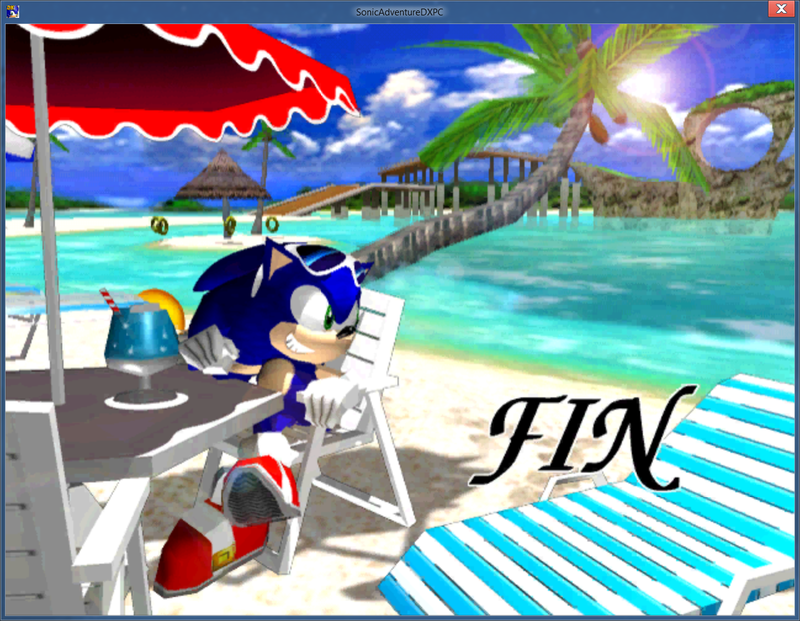 This makes sense because SADX came out on the Gamecube after SA2B, and perhaps this prompted the developers to redesign the models so that the newer release wouldn’t look so different from the sequel that came out first on the Gamecube. I’d also like to mention the redesign of Sky Chase models, which replaced the low-poly “Saturn” style models with more detailed models. This is also an improvement over the original game. 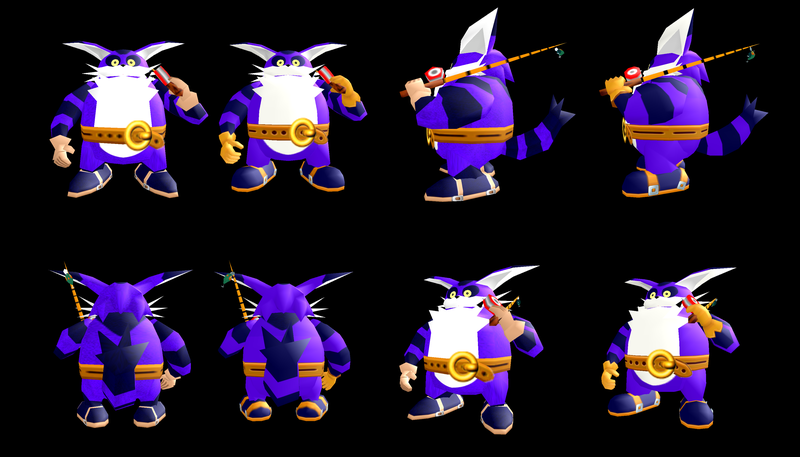 The “fur” textures for all characters were replaced with simple colors or gradients. Some people may not like the “grainy” textures on the Dreamcast models, but replacing the “grain” with a solid color seems like loss of detail. It would’ve probably looked better if the original texture was remade in higher resolution. 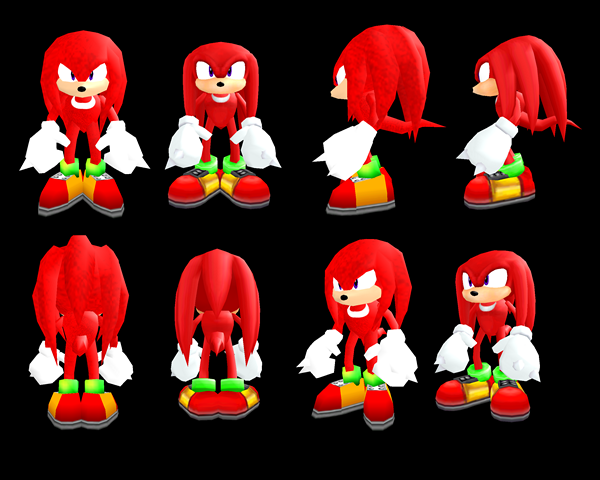 a) Tikal and Eggman only received the higher-poly hands, and not all their models were updated – e.g. 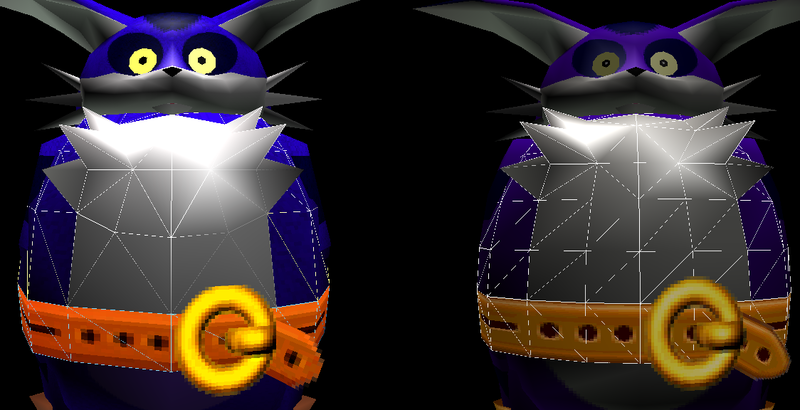 Eggman’s low-poly models in Egg Hornet and Egg Viper were not updated at all. 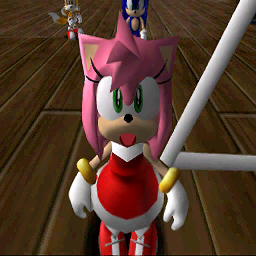 b) Amy’s model in the cutscene where she is captured by Zero is still using her Dreamcast model with mitten hands. 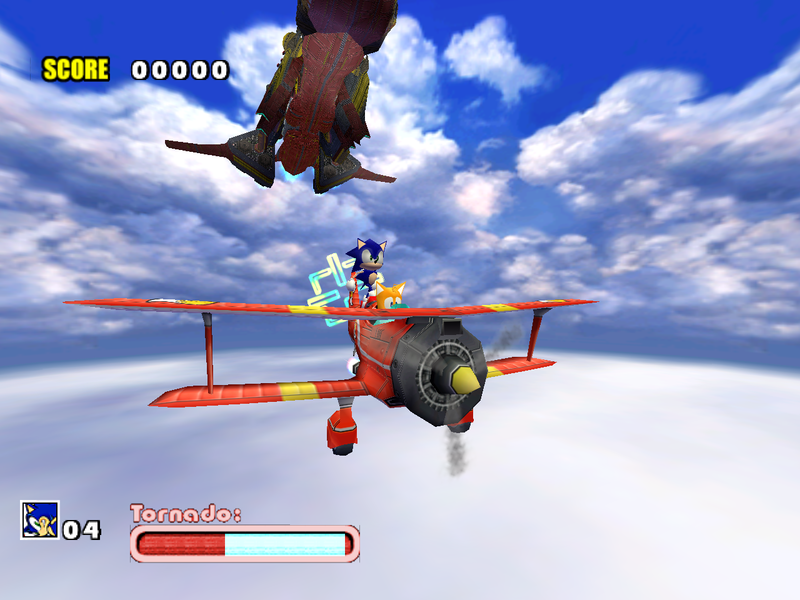 Same problem with Tails in the cutscene where Sonic sees him crash. Gamma’s flashback with Amy also wasn’t updated. 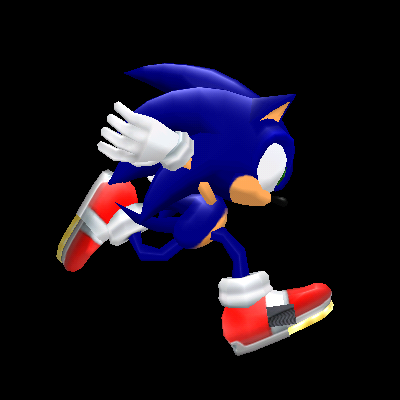 Sonic’s Light Speed Dash aura also wasn’t updated. 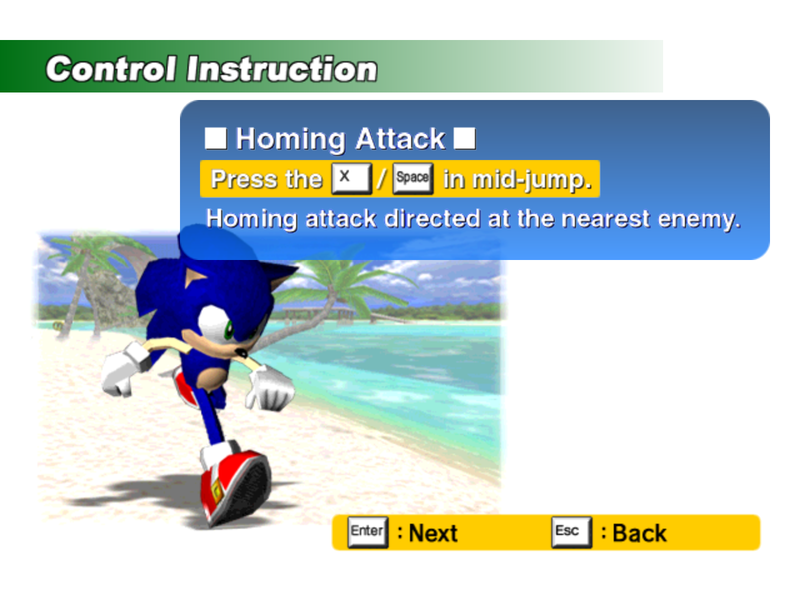 c) The jumping/rolling models for characters were not updated. 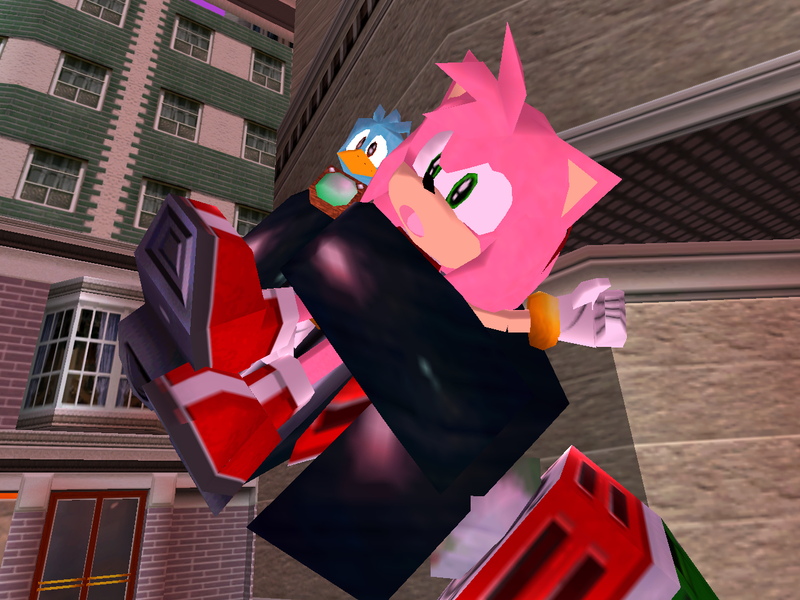 They use the SA1 hand models with SADX hand textures, which doesn’t look too great together with broken vertex welding and lower quality textures. 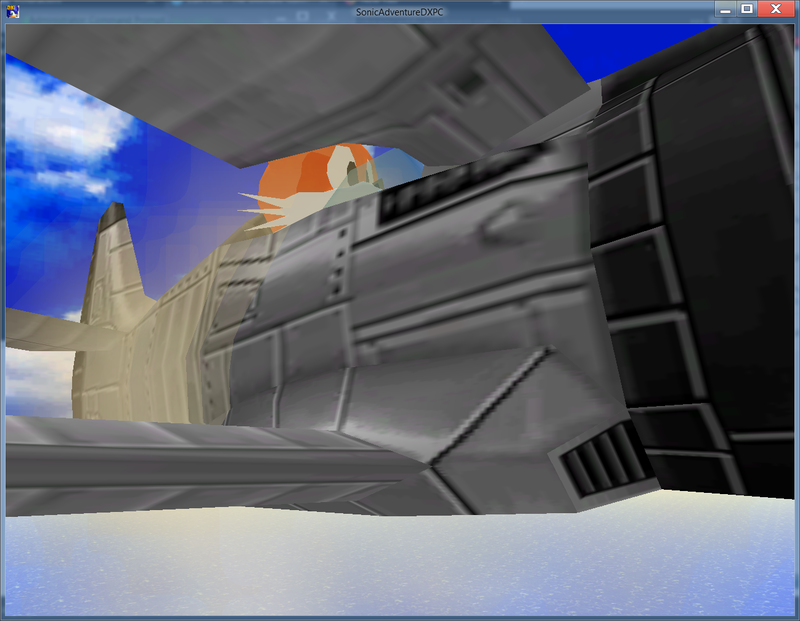 To be fair, vertex welding is broken on the Dreamcast too, but at least it has the correct textures. Lack of updates to anything besides the most visible things is jarring and illustrates the lack of effort put into the model upgrades. 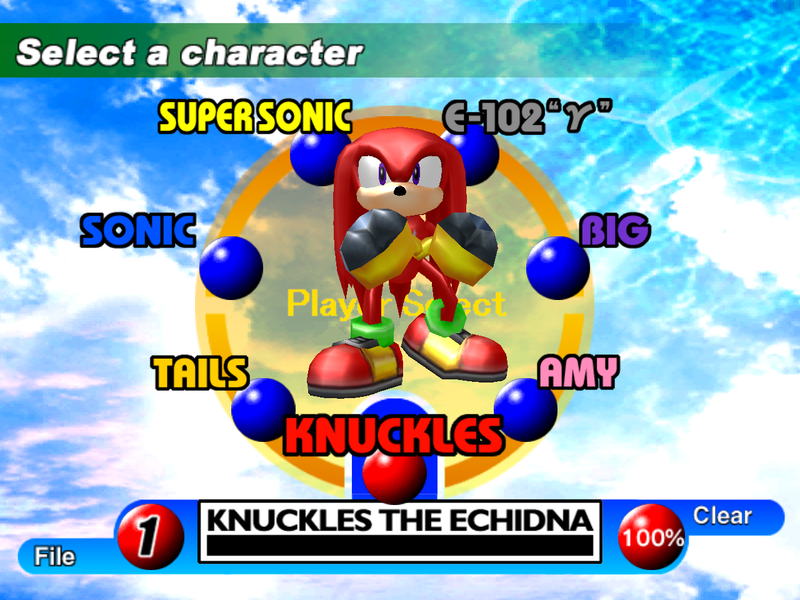 The screenshots seen in the endgame credits were updated to feature new models and environments, but character tutorials and final credit screens still feature the old levels and old models with mitten hands. The updated models are inconsistent with other models in the game. 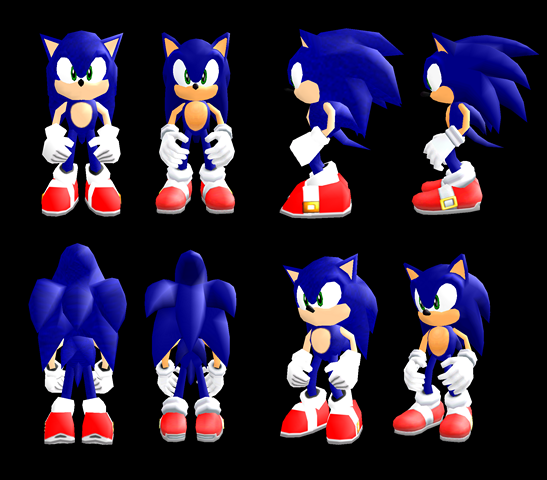 The higher-poly models of Sonic and other characters look strange when they are standing next to NPCs because the NPCs use much more basic models. 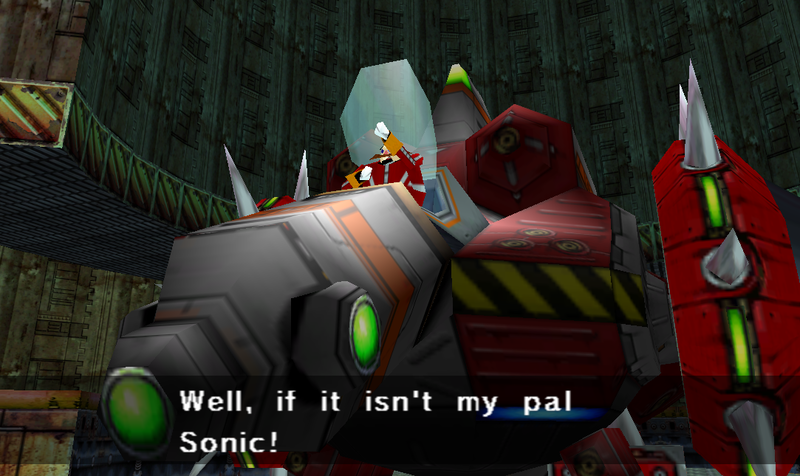 This was already noticeable in the Dreamcast version, but SADX made the contrast even more jarring. 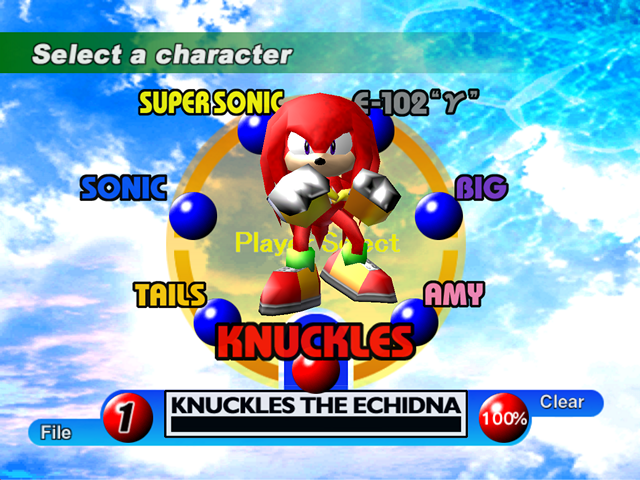 The best example of this inconsistency is Knuckles standing next to an NPC in the Echidna City. His original model looks a lot more consistent with the echidnas than his SA2-inspired model used in the ports. The updated models don’t follow the design guidelines from the Sonic Adventure Stylebook (scroll down a bit or search for “stylebook”). They use wrong shapes and proportions, whereas the original models follow them quite closely. Considering that SADX is supposed to be a better version of Sonic Adventure, the updated characters don’t represent the original game’s artistic vision. 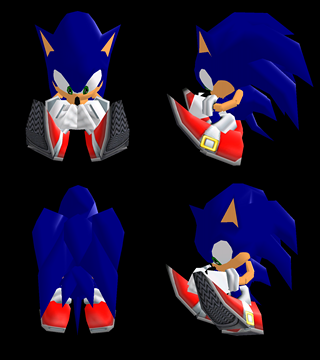 The Dreamcast models had some gloss on them, but the SADX models have much more gloss, which makes them look like plastic. Many people find the excessive gloss unappealing, especially in the PC version, where you can install a NoGloss mod to fix it, or use the Lantern Engine mod to tone it down. 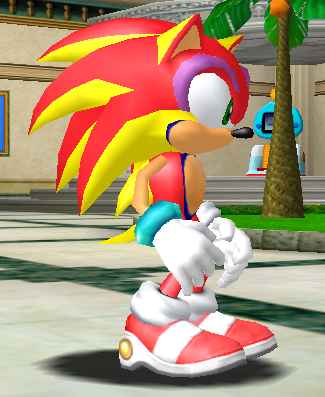 The gloss difference is the side effect of the inferior lighting system in SADX. Check out the section on character gloss in the Lighting post to find out more. The new hands are good to have, but Amy has got monster hands with very long fingers and it looks a bit freaky. 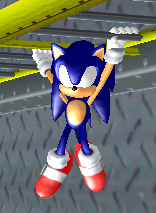 The updated Sonic model has an animation error causing Sonic’s eyes to disappear during his “hanging” animation. The more rounded shoes are good, but the textures used on them were squeezed into one texture, and that texture isn’t very detailed. For example, Amy’s shoes look “dirty” because of the noise that comes from upscaling a low-resolution shoe texture. There is a visible seam between the upper and lower halves of Big’s body in SADX. Big’s model in particular is a great illustration of how a higher poly count improves almost nothing. Did you know that the SADX model has a higher poly count for Big’s body? I didn’t because it looks exactly the same to me. Super Sonic has lost the reflection effect (environment mapping) on his body and is now using a simple yellow texture. 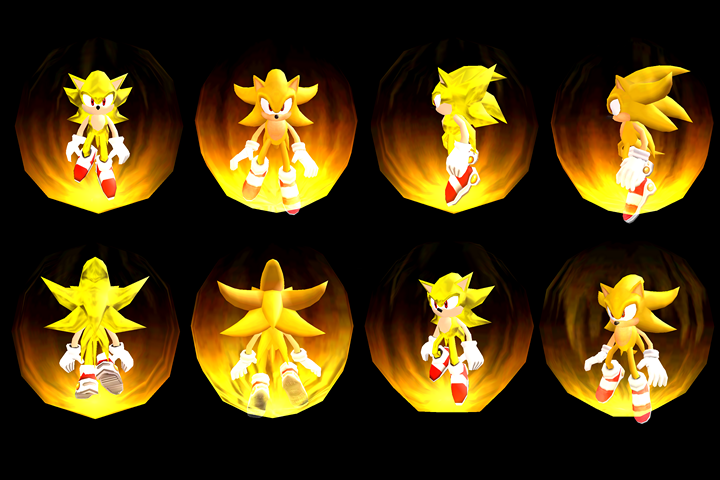 Super Sonic’s foot sticks out of his aura (lol). You can see that the textures used for Sonic’s face and body (stx_hoho and stx_hara), Crystal Ring (stx_itemring) and the shoe buckle (stx_kanagu) are higher resolution in SADX*, but the textures for Sonic’s jump ball, eyes, nose, teeth etc. are the same resolution. 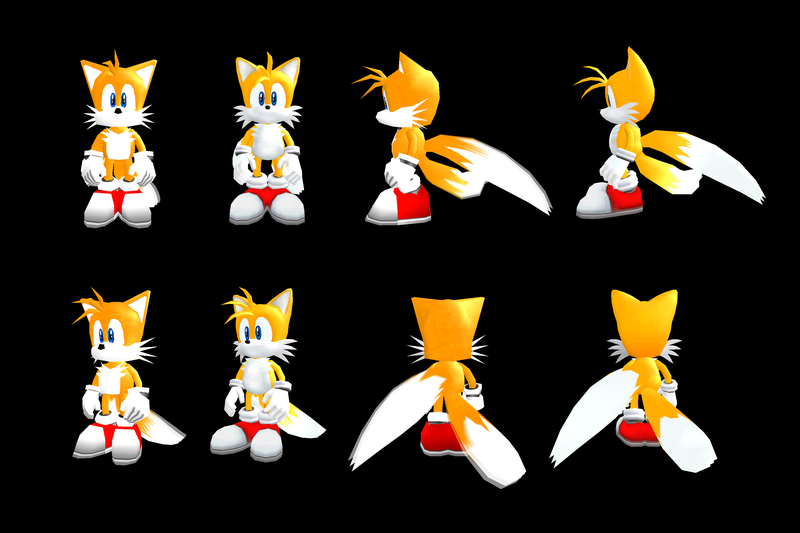 You can also notice that the SADX model uses less textures. This is because most of the shoe textures have been squeezed into one. 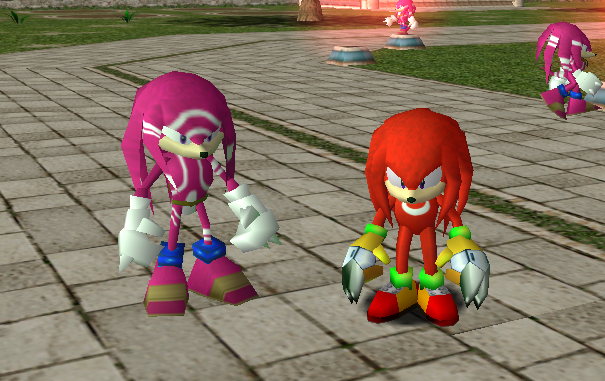 Normally this wouldn’t cause any issues, but in some cases the combined texture in SADX is less detailed than the individual textures used in the Dreamcast version (see the Amy’s shoe example above). *Interestingly the “Autodemo” prototype of the Dreamcast version has higher quality character textures that are mostly on par with SADX resolution wise. As you can see, the SADX texture is split into four pieces, which are applied to different parts of Sonic’s body. If we color code the parts, it looks like this. 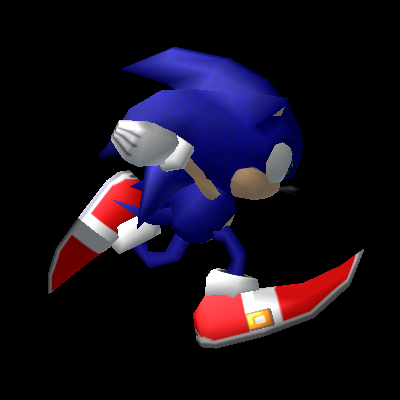 This is obviously an improvement over just one texture in the Dreamcast version, but it also means the resulting texture that gets applied to Sonic’s body is half the resolution of the Dreamcast texture in addition to the loss of “grain” discussed earlier. Note that all textures in the game have suffered from quality reduction, not just the character textures. More on it in the Textures section. 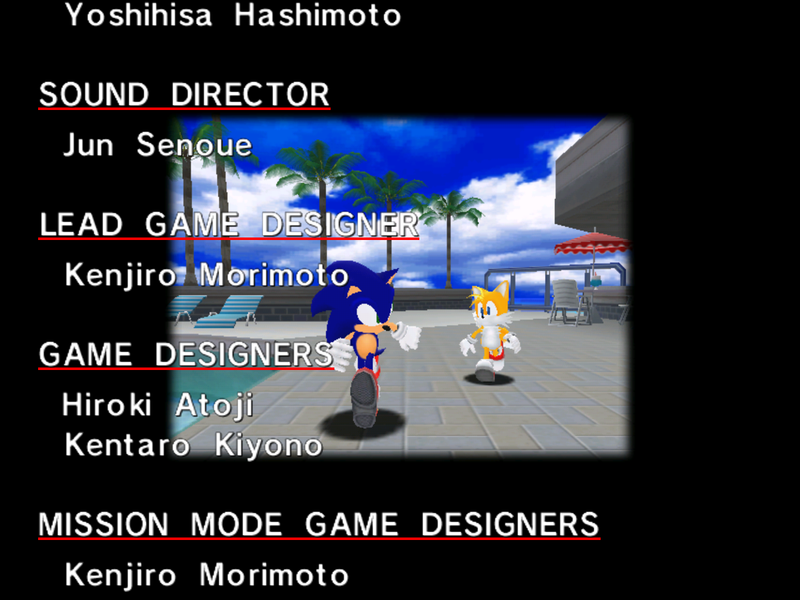 As you can see, the only version of the game where it renders correctly is the Dreamcast version. The front shield texture is supposed to be semi-transparent so that you can see the light behind it. The texture is still transparent on the Gamecube, but the light part is invisible and you see other parts of Gamma’s body through it. In the PC version the front texture is simply opaque. The same problem affects other robot characters, which also have body parts like that. Some time ago we found out what was causing this. 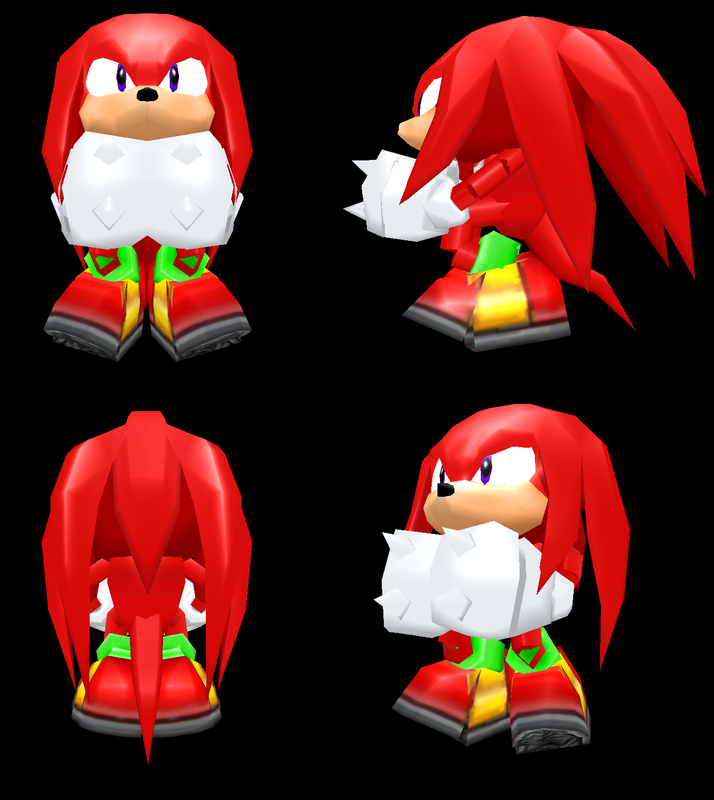 Gamma’s chest uses a mesh type that is not supported in SADX. However, that mesh type is exactly the same as another mesh type (trimesh), which is supported in SADX, so making it work would’ve been extremely trivial, and even if they didn’t want to support it they could just change a few bytes in Gamma’s model to make his chest use the trimesh type. In the PC version and later ports transparency is disabled entirely by using a constant material with no transparency on the whole model. This also would’ve been trivial to fix, although it may have been intentional. Also Gamma’s eyes, parts of his feet and head base are supposed to be lit up at all times. 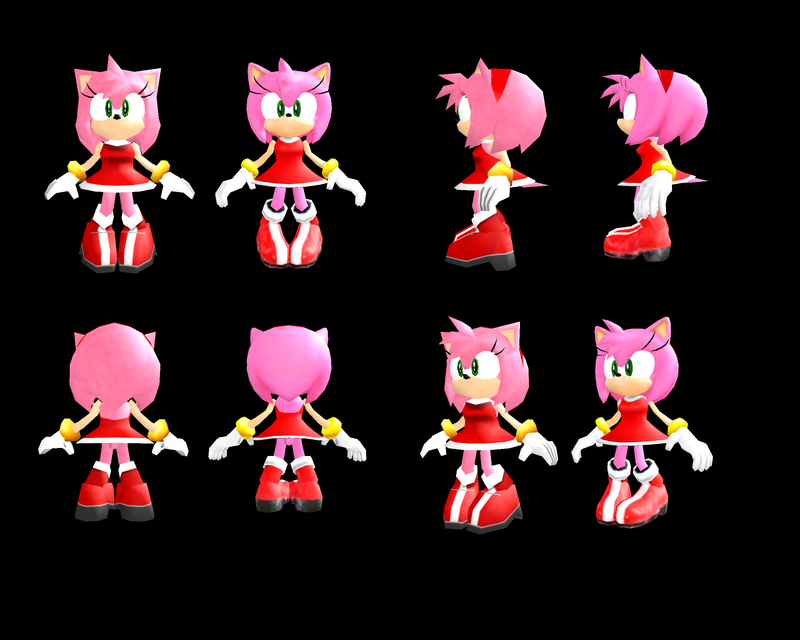 The “ignore lighting” material flags for those body parts were removed in SADX for some reason, so Gamma’s eyes are no longer lit up. Same with Big’s eyes that no longer glow in the dark. 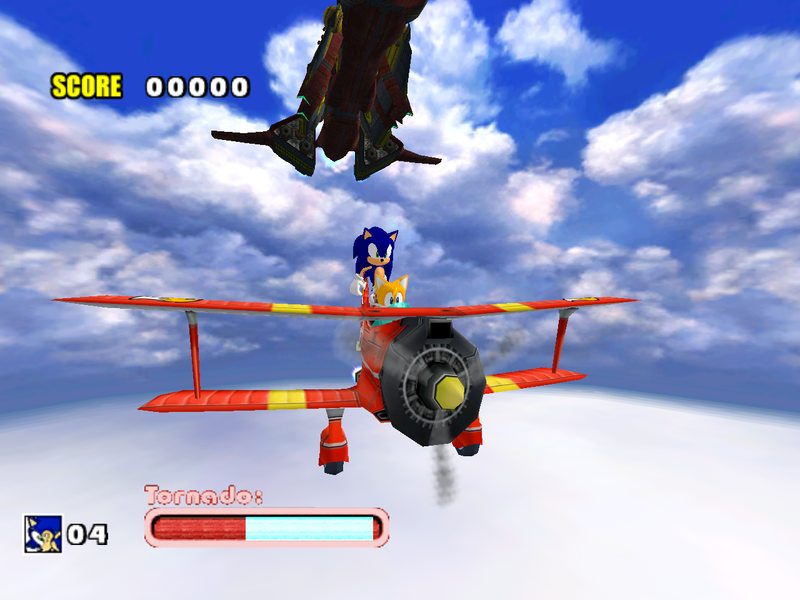 This happens because SADX never sets the correct texture for the effect. It’s supposed to cycle between the first and second texture in SON_EFF.PVM, but SADX sets one of the textures meant for the longer dash trail, which is always purple. Sonic’s model looks glitchy in the SADX screenshot – the shoe buckle is missing and the bottom of the shoes use a strange looking yellow texture. Those are the leftovers of the stretchy shoe effect. 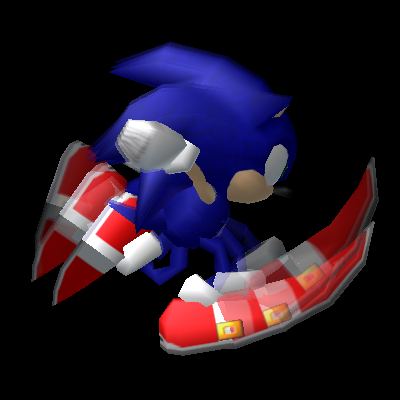 In SADX, the code for the stretchy shoes is still active, and when Sonic is running fast the shoes switch to an old model that wasn’t updated to use the final SADX textures. This is why the bottom of the shoes is using the buckle texture, and the buckle itself is missing. This bug has always been visible in official promotional materials, such as the Steam page. Even with all the problems mentioned above there’s a lot of subjectivity when it comes to saying which models are better. However, in a supposedly enhanced port we shouldn’t have to choose between higher polygon counts for some character models on one side and worse texture quality, removed effects and broken character lighting on the other side. Most of the downgrades discussed here have been fixed in my Dreamcast Conversion mod, where I restored or recreated the missing effects. 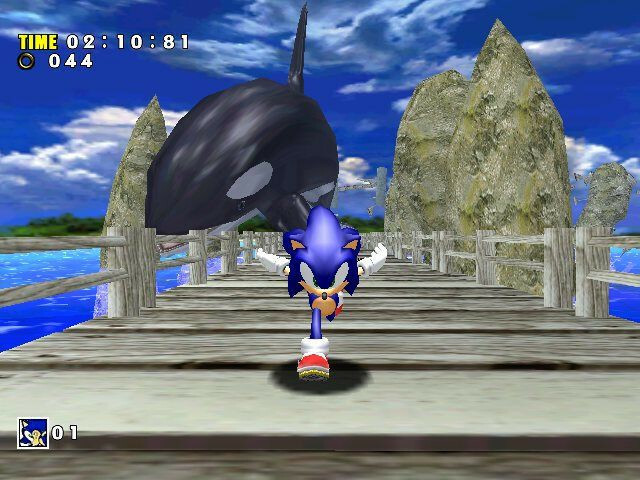 SonicFreak94‘s Lantern Engine mod takes care of level and character lighting, and ItsEasyActually‘s Dreamcast Characters mod is for those who prefer the original Dreamcast models in the PC version. Learn more about the mods here!